There was a response to one of my postings about church interpreters from a follower in California named Lighthouse, who is himself such an interpreter. So I wrote to him and asked him some questions, and he was kind enough to reply. Here are his answers. 1. How did you come into it. Did you volunteer or were you pressed into service? I started by translating my pastor’s messages at church. 2. Did you get any training or were you just thrown in at the deep end? No, I didn’t get any training ... God put it in my heart. 3. How long have you been at it now? 4. What languages are you interpreting? I mostly translate in English and Spanish. 5. How do you do the interpreting? Do you have the equipment for simultaneous interpreting? Do you work alone or in a team? We have the equipment (from listen technologies > www.listentechnologies.com), and freelance. Taken together with the comment from Glasgow (August 11) and with my African and Ottawa experiences (August 9 and 27), this report from California goes to show how widespread church interpreting is. I would draw attention particularly to the answer to question 2. First it characterizes Lighthouse as a Natural-become-Native Translator, while the answer to question 3 proves he is successful at it. Secondly it underscores a point I’ve made earlier (August 3 and September 29), namely that religious translation is an area of translation studies where divine inspiration should be respected as a factor. If you don’t believe in divine inspiration, you might call it something like ‘instinctive compulsion and internal guidance’, but that’s not how the translators concerned perceive it. Incidentally, JD-Glasgow’s August 11 remarks were illuminating on how he perceives what he’s doing and on the difference from conference interpreting. The previous postings about church interpreters were on July 29 and August 3, 9, 11 and 27. From a magazine for Professional Translators, The Linguist, comes an alarming report by Angela Foster involving both Natural and Native Translation. It illustrates how some people assume anybody bilingual may be called on to act as a Natural Translator in an emergency, even for communication that involves technical vocabulary. “Rolando Gómez Aguilar is from Mexico but has lived in London for three years and has an account with HSBC, ‘the world’s local bank’. Although he speaks some English, his communication skills are limited – especially on the phone. When he made a short visit home in April, his [bank] card was blocked on arrival in Mexico City. Most banks provide 24-hour helplines for emergencies, with English-speaking staff on hand to advise. Despite promoting an international image, HSBC’s UK website is available only in English, and Gómez was unable to negotiate his way around it to find the correct number. So it didn’t work out, and it doesn’t say much for HSBC, which is immensely rich and ought to know better. In other words, where translation is needed in those areas, the bank relies on Native Translators – I say Native rather than Natural because we can assume that the employees involved have acquired considerable experience both in banking and its terminology and in translating for clients. Another British bank mentioned in the article is Lloyds TSB. I happen to have an account with them myself. A few years ago I received a letter from my branch in London that needed assistance for me to reply to it. Actually they wanted confirmation that a photocopy of my passport was a true copy before they would execute an instruction I'd sent them. As there are branches of Lloyds here in Valencia, I went into the main one and asked if they could help. The lady who received me told me she didn’t know English, and she made no move to find somebody who did. So I translated the letter into Spanish for her myself – but then, I’m a Professional Translator. Did it do me any good? No way. She informed me officiously that the branch in Valencia could do nothing to help Lloyds clients in England. So I can well imagine something like Mr. Gómez’s predicament occurring in reverse for somebody who needs service in English. Angela Foster. Money talks. The Linguist, October/November 2009, p. 16. Angela is a freelance writer and subeditor. She can be contacted at angfoster70@hotmail.com. The Linguist is the magazine of the Chartered Institute of Linguists, a venerable British institution that will be 100 years old next year. Under editors Miranda and Jessica Moore, it’s become a lively periodical of general-interest articles about language. For translators in particular, it carries a regular column by Peter Newmark. More at www.iol.org.uk. HSBC stands for Hong Kong and Shanghai Banking Corporation. Despite its name, it's another venerable British institution, but this one dating from the rip-roaring colonial China coast days in the 19th century. They tell on their website how they started, but I heard about it from an English friend who had learned Mandarin while working for HSBC in Shanghai in the 1950s. Three weeks ago there was a memorable exhibition chess match here in Valencia between supreme Grand Masters Karpov and Kasparov. Why Valencia? To commemorate that this is probably the place where the powerful Queen piece was introduced into the modern game in the 15th century, some think in homage to Queen Isabella of Castile. The working language of the event being English, a friend of mine was called in at 30 minutes notice (!!) to interpret the commentary, interviews, etc., for Spanish television. His was a Professional Expert job, and as such it doesn’t concern us here. However, he told me some anecdotes that do. 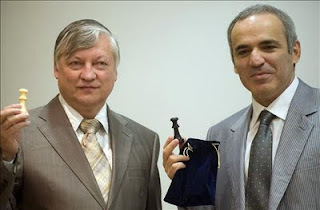 The first is about Karpov. The international chess press were there in force to cover the match, and a Russian journalist asked Karpov a question in Russian. Karpov gave him a long reply, also in Russian naturally. Then the other journalists turned towards my friend for a translation. He had to explain to them that he didn’t know Russian. “Never mind,” said Karpov, “I’ll interpret myself.” And he proceeded to do so into English, at which everybody present was happy. That was autotranslation, aka self-translation: translating what one has said or written oneself. It’s fairly frequent in literary translation; Nabokov did it, for example. But it’s especially common in Natural Translation; in fact, we posited in ‘Translation as an Innate Skill’ (see August 15 posting) that in bilingual infants it precedes transduction (translating between other people). On the face of it, autotranslators enjoy certain advantages. For one thing, they know in advance the meaning of what they’re saying in the first language; they don’t have to make any effort to hear or read, nor – above all – to understand; for them there are no ambiguities. We can therefore hypothesize that the translating process is simpler, faster and imposes less mental strain. For another thing, they’re the proprietors, the ‘copyright holders’ as it were, of their own texts and utterances (though there may be some exceptional circumstances, in court proceedings for instance, where they can’t make changes). Therefore, if they decide to add or omit something, who is to gainsay them? Not that Karpov left anything out, it seems, because his interpretation took as long as his original answer; and when my friend was interpreting him into Spanish, he was insistent that everything be said as he had said it. which is awkward for theorists. Vladimir Nabokov, Mashen'ka, his first novel, translated by the author and Michael Glenny and published as Mary, 1970. Can Interpretation be called Translation? JD-Glasgow, in his comment on my August 27 posting, says that the terms translation and interpretation should not be confused and they aren’t interchangeable. That’s the usual opinion of professional translators and interpreters and of the people who train them. Hence there are many professional Associations of Translators and Interpreters and many Schools of Translation and Interpretation; and at worldwide level there’s the International Federation of Translators on the one hand (though it actually has some interpreter members and committees) and the International Association of Conference Interpreters (strictly for interpreters) on the other. Meanwhile, general language usage is somewhat different. There, there isn’t a sharp distinction between translating and interpreting. A good example of the general language usage is to be seen on TV: when interpretation is being used, a message often flashes over the screen image, “Voice of Translator”. This irks the professionals – a TV producer told me they’re the only viewers who complain – but they should simply recognize that the media address the public in a different ‘register’ from theirs. Now let’s turn to Natural Translation and Native Translation. I submit that for purposes of translation theory and research, translation has two senses like in general language. In a broad sense it can mean translating in any medium: written, spoken or signed. More specifically, it’s used to mean the written sort, and then the oral and signed sort is called interpreting to distinguish it. It would be nice if we had a hypernym whose meaning was unequivocally ‘translation as a whole’, but we don’t. The Germans and Austrians have tried by introducing Translation to cover both Übersetzung (translation) and Dolmetschen (interpretation), as in Zentrum für Translationswissenschaft at the University of Vienna. It began in what was at that time East Germany; I first heard it in Leipzig in 1969 from Otto Kade, the coiner of Translationswissenschaft. But anyway that’s German. For the time being, English speakers are left to cope with a 'lexical gap'. Heidemarie Zalevsky. Über die Sprache hinaus (In memoriam Otto Kade). In Gerd Wotjak (ed. ), Quo vadis Traductologie? Ein halbes Jahrhundert universitäre Ausbildung von Dolmetschern und Übersetzern in Leipzig, Frank & Timme, Berlin, 2007. Good news! 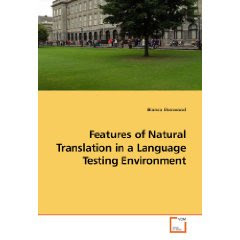 Bianca Sherwood’s thesis Features of Natural Translation in a Language Testing Environment (2000) has at long last been published. It can now be purchased from booksellers like . It reports important empirical research on NT, though I would be inclined today to call the untrained half of her subjects Native Translators rather than Natural Translators, because they had been living for a substantial length of time in a bilingual environment (Ottawa, Canada) and were students at a bilingual university. So they had been exposed to a good deal of sophisticated translation. The comparison Expert Translator group were students in the university’s translator training school. Here’s the abstract. An interesting conclusion can be drawn from the fact that the Native Translator group did not need to be asked to translate by the investigator; they had already done their translations as part of the admission procedure for entrance to their department of the university, which was Physical Education. It implies that the university expected its bilingual students to be able to translate fairly well in their own field of study without any training for it. The same method, i.e. comparing a group of budding Expert Translators with a group of Native Translator students, was used later (2005) in the thesis by Maribel Gomez at the University of Granada in Spain. I was on the jury at the defence, and I remember that in her case too we were struck by how little difference there was between the quality of the translations produced by the two groups. On the other hand, Maribel’s Expert Translators were faster than her Native ones. A likely reason for this is that Bianca (or rather the University of Ottawa) set a text about a specialized subject area with which all the Natives had some acquaintance, whereas Maribel’s Natives were subject-heterogeneous and the text was ‘general knowledge’. Knowledge of the subject matter is of great importance in translating. “But why,” you may ask, “this preoccupation with speed? Isn’t it quality that counts?” The answer is, first, that speed is an indication of the psychological complexity of the task; and secondly, that it’s a very important factor in professional translation. Whatever the quality, if you don’t translate fast enough, you won’t keep your job or you won’t make a living, and you won’t pass the professional (as opposed to academic) examinations. Bianca Sherwood. Features of Natural Translation in a Language Testing Environment. VDM Verlag, Saarbrücken, 2009. Bianca's email address is bsherwo@uottawa.ca. María Isabel Gómez Hurtado. Traducir: ¿capacidad innata o destreza adquirida? [Translating: innate aptitude or acquired skill?]. Advisor: Ricardo Muñoz Martín. Unpublished doctoral dissertation, Facultad de Traducción e Interpretación, Universidad de Granada, 2005. I’ve been reading Ǻsne Seierstad’s The Bookseller of Kabul in the English translation by Ingrid Christophersen; the original is in Norwegian. I’m aware of the controversy and the lawsuit in Norway that the book provoked and I have my sympathies, but I’ll stick to matters of translation. "Finally a note about the translation: overall it does the book justice. The book in its original language is not a literary masterpiece and the language is often riddled with overly simplistic expressions." In short, it’s journalism not literature, and I think Christophersen’s text is of the kind an English-speaking journalist would write. It’s not only a good translation, it’s also a very successful one, since it must have contributed in no small measure to the book’s becoming an international bestseller. I’m glad to see Christophersen’s name appears prominently on the title page. It may be trivia, but it’s interesting that it was the English translation and not the Norwegian original that led to the thinly disguised main character in the book suing the author for defamation and invasion of privacy. Something that may pass unnoticed in a language of limited diffusion may cause a stir when translated into a major world language. What is relevant for this blog, however, is not the translation of the book but the translation within the book and underlying it. It’s a work of what might be called imaginative ethnography. The author lived like a family member in the house of an Afghan family for five months, observed their personal and social lives at close quarters, and built on what they told her. But how did they tell her? She's honest from the start, in the Foreword, about her language problem: “I never mastered Dari, the Persian dialect spoken by the Khan family.” She could hardly be expected to in a few weeks, and yet she needed Dari-speaking informants. "Readers have asked me: ‘How do you know what went on in the heads of the various family members?’ I am not, of course, an omniscient author. Internal dialogue and feelings are based entirely on what family members described to me." Sultan/Rais was certainly a Native Translator: he had long exposure to translations and experience as an interpreter. "Rais, 53, says he even carries [in his bookshop] Western favorites, including the Harry Potter series translated into Farsi." About Mansour and Leila, we don’t have enough background. Even in more scientific ethnographic studies than Seierstad’s, it has constantly been necessary to have recourse to interpreters, and they are unlikely to be Professional or Expert Translators, because of the unusual languages involved and the remote locations. This poses problems of verification (see the Borchgrevink reference), and it’s customary to use a checking technique such as she did. But had The Bookseller of Kabul been written without such aid, it would be a much poorer tale. Ǻsne Seierstad. The Bookseller of Kabul. Translated from Norwegian by Ingrid Christophersen. 2003. Numerous reprints in English and many translations in other languages. Richard McGill Murphy, The war at home. New York Times, December 21, 2003. ‘Kattepusen’. Despite unsophisticated language, a worthwhile read. http://www.amazon.com/review/R19RT227E36ME5/ref=cm_cr_pr_viewpnt#R19RT227E36ME5, 2005. Shah Muhammed Rais. Once Upon a Time There Was a Bookseller in Kabul. Kabul, 2007.This is Sultan’s rebuttal. It’s been translated into Norwegian and Portuguese. Axel Borchgrevink. Silencing language: of anthropologists and interpreters. Ethnography, Vol. 4, No. 1, 95-121, 2003. Today is October 9, El Nou d'Octubre in Valencian, the festival of the Valencians and a holiday in their capital city and its region. It celebrates the entry of James I of Aragon, who had received the surrender of the city from the Muslims a few days earlier. A medieval cross at the end of the main street of the village where I live commemorates his army’s encampment in the area, which is on the coast 5 km south from the city centre. That was in 1238. By the 15th century, Valencia was a rich centre of Mediterranean commerce – it has a magnificent Gothic silk exchange – with a flourishing literature in its own language, Valencià (note the accent), one of the several major varieties of Catalan. There was still a numerous Moorish population; their expulsion was as yet far off. 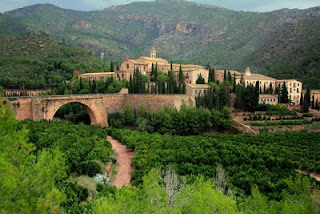 Valencia sent a whole family of popes, the Borgias, to Italy and in return soon received Renaissance art. By 1474 the printing press had reached Valencia. One of the first books printed here, in 1478, was – you guessed it – a translation, in fact one of the earliest of all printed Bibles and the first in the Iberian Peninsula. The translation is attributed to a Valencian cleric, the Carthusian brother Bonifaci Ferrer, who worked on it at the charterhouse of Porta Coeli not far from the city (see photo). Unfortunately, only one leaf from it has survived. The source text was in Latin and perhaps partly in French; the translation was into Valencian, hence it is known as the Bíblia Valenciana . Soon afterwards, the Spanish Inquisition clamped down on vernacular translations of the scriptures. When the interdiction was lifted in the Spain of the Enlightenment nearly three centuries later, the first authorized Catholic translation of the Vulgate into Spanish was also published in Valencia (1790-1793). The Wikipedia Español articles on Bonifacio Ferrer and on Felipe Scío de San Miguel, principal translator of the 1790-1793 Spanish Bible. One curious but by no means unique thing about the Tirant is that it’s a pseudo-translation, that is to say an original work that pretends to be a translation, in this case from English. And on November 11, at the International Symposium on Interpreting Studies in Castellón de la Plana, Spain, the opening paper will be A Cognitive Perspective on Natural Translation by Prof. Ricardo Muñoz of the University of Las Palmas. Another distinguished speaker will be Ann Corsellis, the Cambridge magistrate who has had an important influence on the development of accreditation for court and public service interpreters in the UK. There’s no lack of material out there. The blog, with its concomitant correspondence (which I enjoy), is threatening to snowball, and I don’t want it to snow either you or me under. So I mean to keep it to two postings a week, one midweek and one at the weekend. Diana Cossato has kindly drawn my attention to a research project at the Thomas Coram Research Unit, Institute of Education, University of London. It’s called Transforming Experiences: Adults Who Interpreted For Their Parents in Childhood, and the leading investigator is Prof. Anne Phoenix, who teaches psychology. An increasing number of adults in Britain have, as children, done some interpreting for their parents. This means that they sometimes have to assume responsibilities in situations (for example in shops, in schools and at GP surgeries) where children are often expected to be relatively silent. Very little is known about how the experiences of people who have grown up translating and interpreting for their parents have influenced how they think about themselves over time. In other words, there is little understanding of the impact of such experiences on their identities. The project aims to develop an understanding of how the experience of interpreting and translating as a child impacts the identity and life perspectives of members of a group about which very little is known. The research involves interviewing adults and audio recording their stories. So the approach is retrospective, and personality oriented. I notice that one member of the project Advisory Group is Nigel Hall of Manchester Metropolitan University, the leading promoter of Language Brokering research in the UK; the others are all psychologists, sociologists or educationists without any apparent connection with interpreting. It would be interesting if somebody could eventually compare the results of this British research with those of the American researchers like Orellana (see blog posting of September 19). The project is looking for people to interview.